chinaworker.info is republishing this statement sent to us by a left-wing activist group in China calling for solidarity from the international workers’ movement with the workers at Jiashi (Jasic) Technology in Shenzhen. Around 30 workers have been arrested for their part in this struggle for basic union rights. 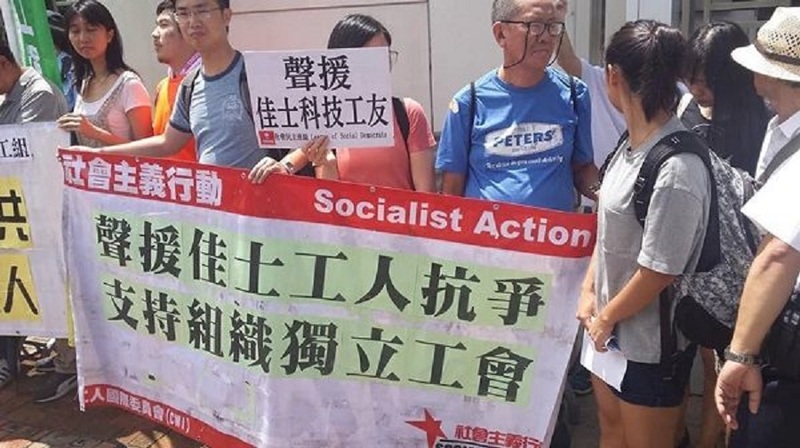 chinaworker.info and our Hong Kong sister organisation Socialist Action fully support the demands of the Jasic workers and have been active in raising this issue and protesting the repression by the CCP (so-called Communist) regime against the workers. Shenzhen Jiashi Technology Co., Ltd., a listed company, has been imposing on employees overtime work, illegal fines, half-day off per month (even then forced to jog with the boss). It doesn’t pay for the workers’ housing fund, discloses union activists’ information to other companies to blacklist them. On May 10, 2018, several employee representatives went to the District’s ‘official’ Worker Union with a joint letter for Jiashi workers, complaining about the company’s illegal management and hoping that they could organize their own labor union in the company. The vice chairman of the District Federation of Trade Unions declared that the labor union could be organized by themselves. On June 7, 2018, these employees submitted an application for organizing a union to the District Federation and to its subsidiary Street Unions. The officials instructed that the representatives can first recruit members by themselves. Shenzhen: Workers demand the release of their comrades. Under the direction of the District Unions, the representatives prepared an “Questionnaire of Willingness to Join Jiashi Trade Union”, and as many as 89 employees signed to join. However, on July 12, 2018, vice chairman of the District Federation, and other four union officials, together with Jiashi deputy general manager and department managers blamed the representative Mi Jiuping. The vice chairman of District Federation had approved the application one month before, suddenly turned hostile and said it is illegal for Jiashi workers to establish a union. Hong Kong protest against arrests and dismissal of Jasic Technology workers. On July 26, several worker representatives were beaten by the factory security guards once again and taken away of cell phones, in which there were the evidence against the company illegal actions, the company’s managers believed. And the coming police warned the beaten workers to obey orders, letting the beaters as unpunished as last time! And the next day Jiashi factory restricted worker representatives and other activists’ personal freedom and handed over them to local police station. Coworkers who went to police station asking for release were also arrested. In the evening, police even intruded into representatives Liu Penghua and Guang Hengshu’s houses and took their family members away! There were totally over 30 people, including union initiators, their families and supporters.